This is probably one of the most anticipated feature update on Whatsapp. Previously (or currently for most of us), we could only mute groups got the longest of 1 week. In latest update, we can mute groups up to 100 years! There’s also a checkbox to totally remove notification from a certain group after it has been muted. This is especially useful for groups that you seriously don’t care about but don’t want to leave the conversation. This new update also adds a new ‘camera’ button that allows users to quickly snap a photo to send out while in a conversation. 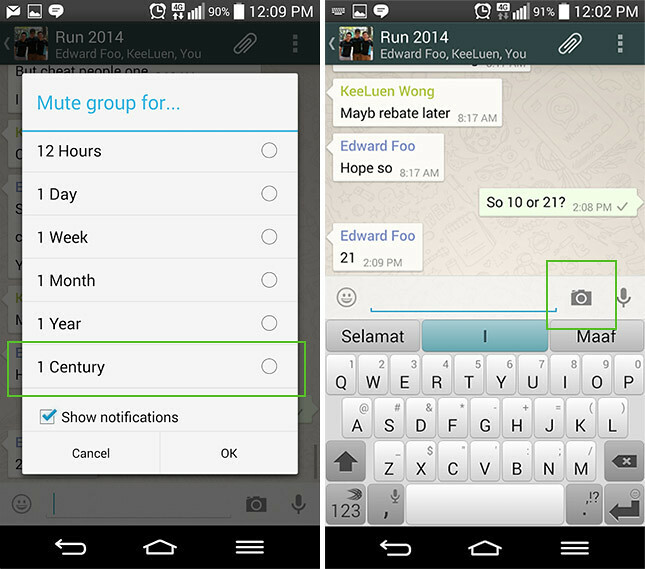 One Response to "WhatsApp For Android Lets Users Mute Groups For 100 Years In New Update"